Low-Carb Bacon and Candied Pecan Dark Chocolate Bark | Low-Carb, So Simple! This chocolate bark is very easy to do, but remembering a couple of tricks might help. Because the caramelized pecans are pretty hard, it’s better to chop them into small enough pieces, that makes it more pleasant to eat them. When caramelizing the pecans, I prefer to spread the hot, ready mixture to cool down on a ceramic plate. You can also use parchment paper since the mixture might get stuck to the plate. I have always got it off anyway from the plate in one piece so plate is not too bad of a choice anyway. When melting the chocolate, you can melt it in the microwave (my preference!) or in water bath (bain-marie). Just remember not to burn the chocolate if you melt it in the microwave, or let any water (not even a drop!) to the chocolate if you use water bath. Store the ready bark in the fridge. Why? Just because that’s the best way to keep that delicate and delicious crunchiness! If you store this bacon and pecan chocolate bark at room temperature, it might get soggy and also the chocolate is much softer, losing that delicious crunch. First things first, fry your bacon crispy. I use skillet for that. Now the bacon is perfectly crispy, oozing that delicious salty fat and flavor! Just set the bacon aside to cool down and use the fat for other purposes, like for cooking (or baconnaise!!). Next, take the sweetener and let it melt in a clean skillet (I wonder what happens if you use the bacon fat here…? Will the pecans lose their crunchiness…?) Anyway, brown sugar substitute is a must here, I expect that white erythritol or xylitol won’t work that well. They would just leave that nasty cooling effect which is very characteristic to them. Add the pecans to the melted sweetener and mix well. Cook, constantly stirring, until the pecans get golden brown color and are all over covered with the sweetener. Be careful here, the pecans burn easily, so keep your eyes on them all the time! Pour the hot pecan mixture on a ceramic plate or on parchment paper. Let cool down completely and chop into small pieces, preferably with a sharp knife. You can also break it by hands. This is a good point to crumble the bacon. I prefer to crumble the bacon by hands, but in case you don’t want to get greasy fingers (which you can lick with great pleasure afterwards!) by all means feel free to use knife for chopping the bacon. …until the chocolate is completely melted. First, combine the bacon and the candied pecans. Mix well. Doesn’t look too beautiful, but believe me, the taste is beyond amazing! Now just let the whole thing cool down and the chocolate set. When I made these, it was so cold outside that I just placed the parchment paper with the chocolate outside for a while and got ready bark in minutes. You can naturally use fridge to let the chocolate set. It doesn’t take too long, just a half an hour or maybe an hour. While the chocolate is setting, that’s a good point to clean the mess. So messy, but SO worth it! When the chocolate is completely set, break it into rough pieces of preferred size. These are some 2×2-inch (5×5 cm) pieces here, maybe a tad larger. Enjoy either alone or in a good company! Well, it was a cold and stormy night. Now, wait a minute! It wasn’t night nor was it stormy, but it was definitely cold winter. I was actually developing anti-antiety chocolate bar recipe for my Curb Anxiety blog and experimenting with different ingredients. For the anxiety blog recipe, I wanted to include the most nutrient-rich ingredients which contain especially magnesium. Then I thought, well, would be nice to develop a delicious chocolate recipe for this blog as well, naturally with ingredients. I just adore homemade chocolate bars and barks and definitely should post more chocolate recipes… I guess you agree! For my anxiety blog, also I wanted to make the chocolate part. You know, that kind of low-carb chocolate which uses cocoa butter, cocoa powder, and sweetener. I was experimenting a lot, and finally managed to create crispy chocolate bars, with all the bells and whistles, that satisfy both body and mind. I used plenty of different seeds as they are very nutritious and also coconut oil because it’s good for the brain, too. Besides Anxiety Curbing Orange Walnut Fudge, that Anti-Anxiety Chocolate Bar recipe is definitely the most loved recipe on my anxiety blog! Looks that chocolate is indeed great against anxiety (though it does have some caffeine, so if you are sensitive to caffeine, you should be careful not to eat too much chocolate). For the recipe for this blog — as we know how much I love simple things — I chose commercial dark chocolate with 85 % cocoa. I use German chocolate; our relatives send loads of that good stuff to us here in Finland. That chocolate is just so cheap there, in Aldi. 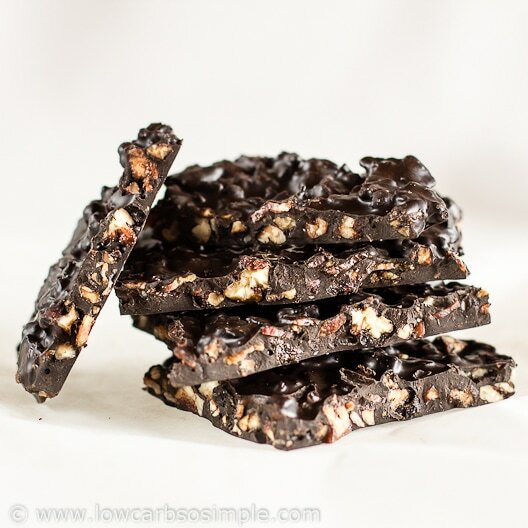 And now, rather than low-carb chocolate bars, I wanted to create low-carb chocolate bark. However, what to use in my low-carb chocolate bark beside that heavenly 85% dark chocolate? I had dozens of ideas! Bacon was the first thing that came to my mind. Well, I’ve seen recipes for chocolate covered bacon, so if I crumble some crispy bacon to my low-carb chocolate bark, it should be a perfect match. However, there is not too much sweetness then. Very dark chocolate is not sweet, and bacon is pretty salty. I need something to sweeten the chocolate bark — something low in carbs — to complement the salty flavors. I wanted to have more crunch, so something candied might do the trick. Hmm, maybe candied slivered almonds…? I have Sukrin Gold and that might suit for caramelizing i.e. making that candied stuff. So, my first plan was clear: 8 slices bacon, 1 cup (240 ml) slivered almonds, 1/3 cup (80 ml) Sukrin Gold, 2 tablespoons water (they always use water when making candied nuts, don’t they? ), and 16 oz (230 g) 85% chocolate. Well, when I finally started my first experiment, I had to change things a bit. First, I lacked slivered almonds, and you cannot even buy them here in Finland! Can you imagine? Nobody sells slivered almonds! So if I need them, I make them myself, which — as you might imagine — is a terribly laborious task. Instead of slivered almonds, I used chopped hazelnuts just because I happened to have them at hand and they were about to expire (experiments are a great way to use leftovers or close-to-best-before-date stuff!) Because 1 cup (240 ml) chopped hazelnuts looked like far too much, I decided to use 1/2 cup (120 ml) instead. I caramelized the hazelnuts with 1/4 cup (60 ml) Sukrin Gold and 1 tablespoon water. To my surprise, the water made the mixture pretty, well, watery. The candied hazelnuts were not crunchy, however, after cooling down the mixture, it became quite crunchy. In any case, I wanted to see how caramelizing works without water, and if I could get an even crunchier result. Because I still had those soon-to-be-expired hazelnuts, I also used them in my next caramelizing experiment. This this experiment, I didn’t use water, but otherwise, the same stuff I used in my first experiment. The result was really crunchy, actually quite hard. The key was to chop the nuts finely enough, so they were not too large and thus not too big chunks to bite. Also, the nuts needed adjusting. 1/2 cup (120 ml) was slightly too little, and since 1 cup (240 ml) was too much, I decided to try with 2/3 cup (160 ml) chopped nuts. I still wasn’t in the mood for making slivered almonds, so I looked in my pantry and used candied pecans instead. C’mon, isn’t it the ultimate experience anyway, bacon, chocolate and candied pecans? Yum! How mouth-watering! And if I still would add maple flavor, that would make the whole thing something extremely American! One final adjustment was still needed: 8 slices of bacon were not enough, so 12-16 slices were just right. I did an experiment where I crumbled 12 slices of bacon (you see this in the photos), and that was just the right amount. However, I would expect real bacon lovers to use 16 slices. I was happy with my ready recipe, and I just couldn’t stop eating the delicious bark, which was bursting wonderful flavors and had a perfect crunch! And here is finally the recipe, enjoy! Heat a large skillet over high heat. Add the Sukrin Gold and let it melt completely. Add the pecans and cook, constantly stirring, until the nuts get golden brown color and are caramelized. Don't let them burn! Transfer the caramelized pecans to a plate or parchment paper. Let cool completely and chop into pieces. Melt the chocolate in a microwave oven or in water bath. Stir in the bacon and the caramelized pecans. Add also the maple flavor if you use it. Pour onto a baking sheet and spread until 0.3 inches (0.7 cm) thick. Chop the ready bark into pieces. As when always making chocolate bark, you can create endless variations. However, to be honest, I wouldn’t change too many things in this well-thought combination of flavors and textures. Naturally, if you don’t have pecans, you can use other nuts, but pecans just seem to be the best nuts taste-wise and texture-wise for this particular chocolate bark. Macadamias might be worth experimenting with, though. However, like I said, maple flavor is a perfect to accompany bacon and pecans, so please feel free to add 1 teaspoon maple flavor to the melted chocolate. I made one batch with maple flavor, and it was pretty good! (It might have been even better if my maple flavor hadn’t expired in 2013… don’t tell anyone!) Well, now when I think about it, I wonder what happens if you add the maple flavor to the melted sweetener when caramelizing the nuts…? Might be an even better solution than adding the maple flavor to the melted chocolate! And I never managed to try those slivered almonds, so if you do, please let me know how the bark tastes with them! A few days ago I was in Helsinki (capital of Finland) for an author interview about me and my book. The cafeteria where the interview took place was really cozy and people were nice. We were several authors from the same publisher who got interviewed. A really nice experience! Can I ask you to convert the pecans recipe amount to grams as obviously no use to measure in ml. Is it still 160g? Hi Sean, it’s 85 grams. I’m in Australia. What is it? And what’s in it? I’ve never seen anything like it here. I have erythritol and xylitol – both of which I use sparingly, as after more than three years of eating LCHF, my sweet tooth has basically left the building! I do like a touch of sweet … but not clawingly so. Hi Helen, I’m afraid Sukrin Gold cannot be found from Australia… Any erythritol-based brown sugar substitute would work, but I don’t know if you have those available. You can use that erythritol you have instead of Sukrin Gold, however it won’t be the best solution, and to avoid the cooling aftertaste, maybe reduce the amount a bit. You can naturally leave the erythritol out and use just chocolate, bacon, and pecans; maybe add some stevia (if you have) for additional sweetness in the chocolate. However, toasting the pecans in erythritol gives a nice crunch. Hope this helps! Do you think just like sugar brown sugar would work? Not sure if it hardens… but basically it should. I love this recipe and would like to try it out. But my question: Is there anything I can replace the sukrin gold with? Hi Cristiana, thanks for your comment. Sukrin Gold is the best option, however you can try with regular erythritol or xylitol but I’m afraid they don’t produce very satisfacory result. On the other hand, you can omit the sweetener, or just add stevia to the melted chocolate and toast. The final result won’t be that crunchy but I bet it will be still palatable. This recipe looks so good that I wanted to make it today but I guess I have to order Sukrin Gold and make the chocolate bark after I got it. You’re welcome, Cristiana. Sorry there were words missing from my reply, I don’t know where they disappeared. What I meant was that you can toast the pecans on a dry skillet and add stevia or other sweetener to the melted chocolate. The result will be a bit crunchy, but not that crunchy like with Sukrin Gold. This recipe had me sit up and take notice. I love the combination of bacon and chocolate and the addition of the Sukrin Gold was genius! Thanks for sharing a great recipe. Oh my gosh, bacon with anything is really darn good. Thanks for sharing! Thanks, Linda, for your comment!